This is an In Person Signed Colour 10" x 8" Photo of the popular young Australian Golfer. 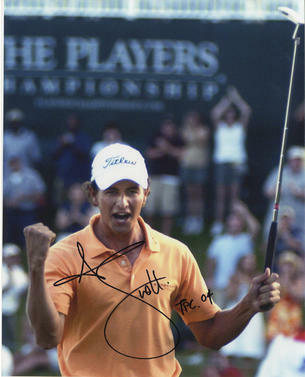 Adam Derek Scott (born 16 July 1980) is an Australian professional golfer. On 7 January 2007, he reached a career high Official World Golf Ranking of third with a second place finish at the Mercedes-Benz Championship. Scott is often talked of as a natural successor to Greg Norman in Australian golf, an impression reinforced when Norman's former caddy joined up with him in 2004, and he is coached by noted instructor Butch Harmon.